Tens of thousands of people took to the streets in London on Saturday (May 14) to demand a better deal for British workers, who are now enduring falling living standards not seen since Victorian times. 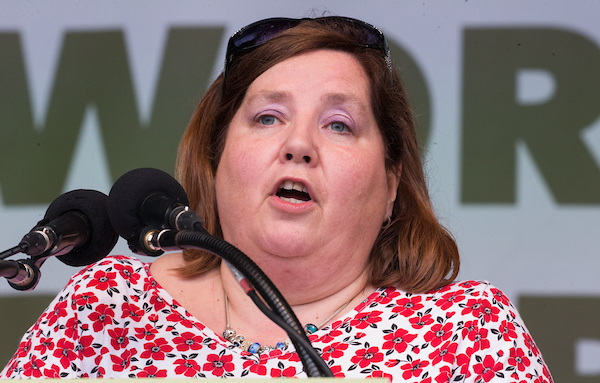 The TUC march – supported by several unions including Unite – gathered trade unionists and campaigners from across the UK to call for a £10 an hour minimum wage, an end to zero hours contracts and proper funding for public services among other demands. 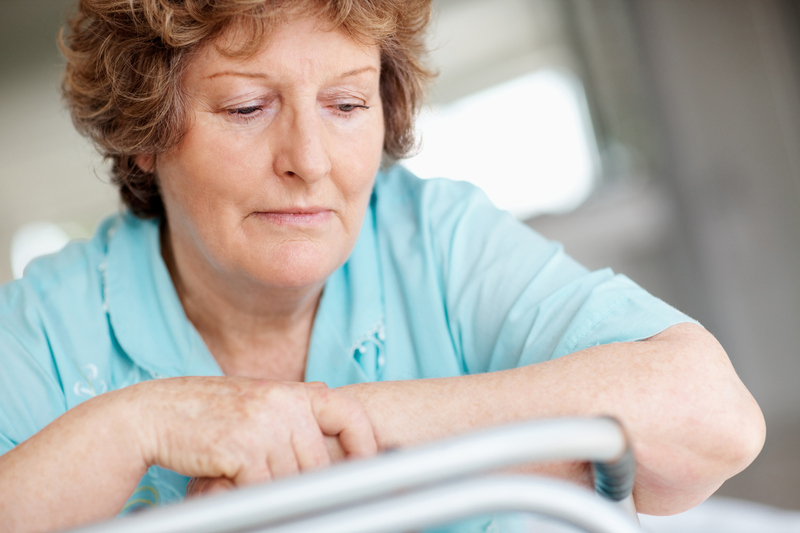 A recent TUC analysis found that real wages in the UK are still £24 less than they were a decade ago when the financial crisis first hit – that’s the worst wage squeeze in 200 years, when much of Europe was ravaged by the Napoleonic wars. Leading the march were TGI Fridays waiters, Unite members (pictured below), who will be taking part in their first ever strike this Friday (May 18). They marched alongside McDonald’s workers who are likewise participating in their first ever UK strikes. 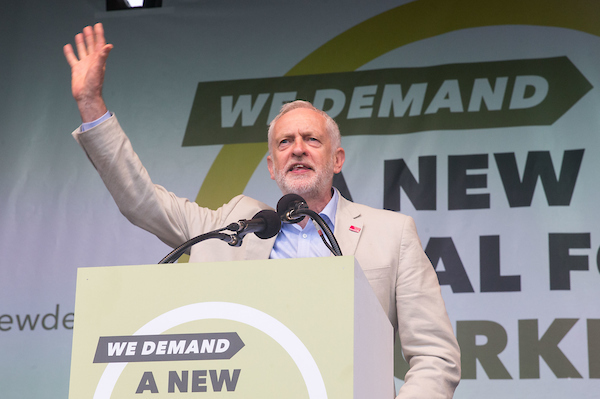 Protestors wound their way down to Hyde Park where speakers, including Unite general secretary Len McCluskey, Labour leader Jeremy Corbyn and TUC general secretary Frances O’Grady addressed the crowds. Workers too told their stories of struggle and victory. 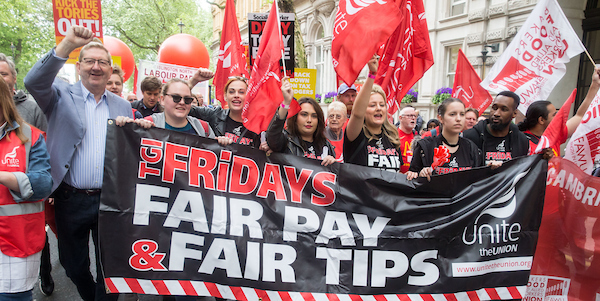 Unite rep and TGI Fridays waitress Lauren explained how in January, management pushed through a grossly unfair new tipping policy which would see servers lose 40 per cent of their card tips, amounting to an average of more than £250 a month. The waiters complained to their bosses, she said, but to no avail. “And then we unionised,” Lauren told protestors at the rally. 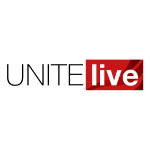 “Joining Unite was the best thing we’ve ever done – finally we have a voice. 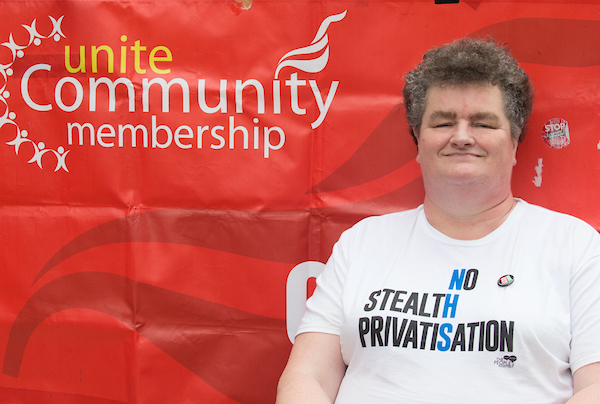 Unite rep and Bombardier worker Gaye Partridge (pictured below)told of how she and her fellow colleagues took on Boeing – and won. “We pulled off an amazing win against the largest aircraft manufacturer in the world,” she explained, detailing how Unite lobbied against punitive tariffs threatening Bombardier’s C-Series jet, which if implemented by US trade authorities would have risked thousands of jobs in Northern Ireland. But thanks to Unite and its members’ relentless pressure, the US authorities ruled against imposing the tariffs which Boeing had used all its corporate might to push through. Unite members from across the UK shared with UNITElive why they were marching on Saturday (May 12). Unite Community member Liz Byrne (pictured below) said that even though she isn’t working because of her disabilities, she’s come out to support those who do. “I’ve come to support the unions – I think people who work so hard should get fair pay for their jobs,” she said. 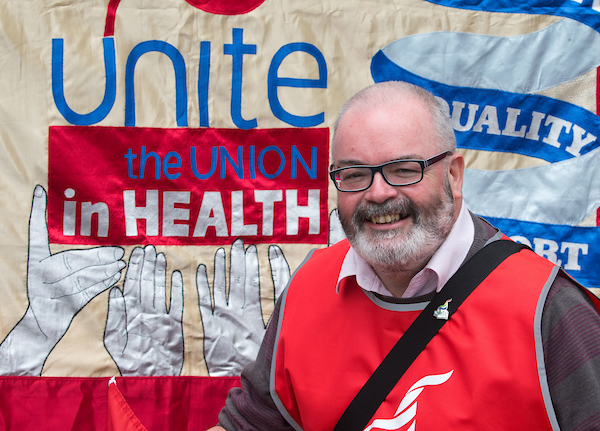 NHS worker and Unite rep Alan Dobbie (pictured below), from north London, told UNITElive he was out marching in support of the NHS and other public services now at breaking point because of government policies. 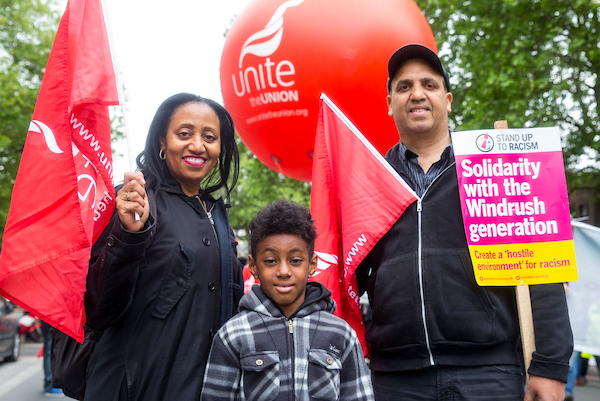 Unite shop steward and bus worker Kenny McKay brought his wife, Josephine and their seven-year-old grandson Daniel (pictured below) to the march. 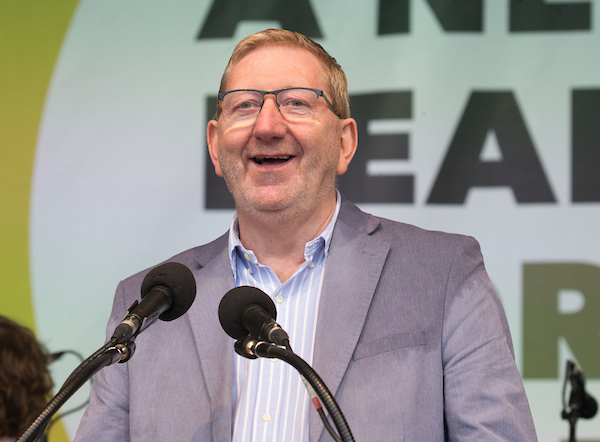 Unite general secretary Len McCluskey (pictured below) addressed protestors at the rally as he urged working people make their voices heard against the forces oppressing them. He slammed ‘the spivs and speculators’ who don’t pay their taxes and caused the financial crisis; the same people who demonise those who actually “create the wealth of our nation” – workers. Labour leader Jeremy Corbyn (pictured below) likewise galvanised the tens of thousands of working people, their families, friends and supporters who stood out in the rain to stand up for fairness and equality.